Ruth E. Blyden is a senior attending Berea College in Kentucky and will be graduating in May 2008 with a B.S degree in Business Administration with a concentration in Accounting. 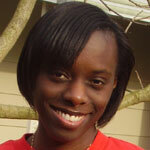 She is originally from Freetown, Sierra Leone, but lives between California and Maryland. Blyden discovered Berea through friends. Berea has provided her with world class education since 2005. She is a Teaching Assistant for the General Education Department at the college, and an assistant at the Office of Internships. She is also involved with the African Students Association. After graduation she plans to become a Certified Public Accountant. Ruth E. Blyden is the great great granddaughter of Edward Wilmot Blyden.